Petrie Memorial UMC sponsors a countywide construction mission camp. 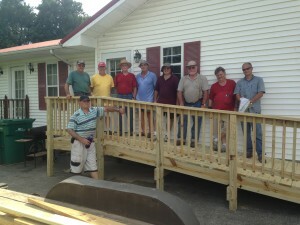 Many area churches join with Petrie to construct much needed handicap ramps for area residents. These ramps are constructed at no cost to the resident. Not only do the residents get a new ramp meeting all construction codes, but many hours of hard work, fun, fellowship, and prayer are also provided.